it’s often the simplest meals at restaurants that leave the biggest impression with me. i ordered a goat cheese and roasted nut salad when dining out at a french restaurant a few months ago. it was pretty classic: good cheese on toasted bread, with properly dressed greens, nutty accents, and it was immensely pleasing. that’s why the classic pairings are classic right? if it works, why mess with it. but, messing with a classic recipe a little means you can adapt it to suit your own tastes. i recently bought some hazelnut oil–for the first time, and discovered two things. 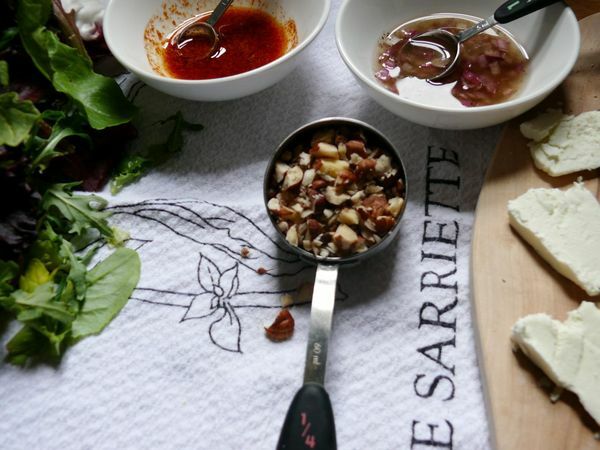 using a nutty oil is an easy way to completely change up the salad you may be making week in and week out. i have a slight hazelnut allergy. yep. my throat closes a little and my tongue gets slightly fuzzy every time i have my first taste of the oil or a bite of hazelnuts. ignoring it seems to make it go away. anyway, i have repeatedly made a salad similar to that one from the restaurant, adapting it to use my new hazelnut oil and chopped hazelnuts, which i love, even if they’re trying to kill me. 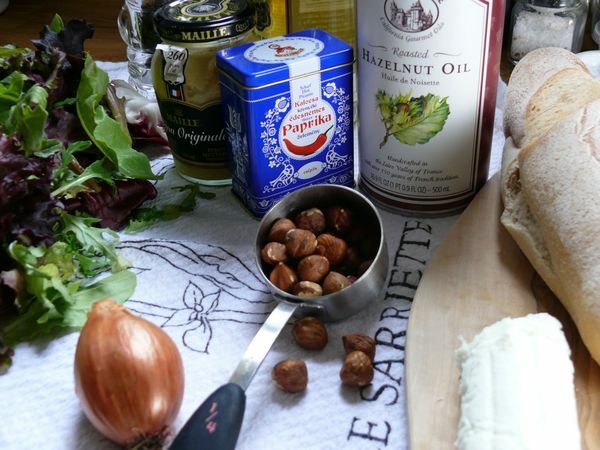 i toast the hazelnuts and the bread at the same time, in the oven, while the cheese gets all warm and soft too. served on a bed of shallot-y greens, it was easy and lovely as a starter or as a meal itself. but the little pyramid of flavours on the toast seemed deserving of a little treat. i thought about adding some herbs but i opted for something a little bolder. i whipped up a paprika oil with mustard to thicken it up and it was perfection. i love this simple dressing so much that it’s going to become a condiment that i use on sandwiches, to dip my fries into, to drizzle on pizza, a marinade for the grill… if you try it and feel the same way, i’d love to know what you think it would be great on. i always start out eating this salad with a knife and fork, and switch to picking up the toasts with my hands half way through. biting directly into the cheese, nuts and oil is so much more satisfying. some say eating salad that way is great too. i keep forgetting to try that, but with the paprika oil mixing into the leaves, this might be just the salad to eat sans utensils. a good excuse to lick your fingers–as if you need one. preheat the oven to 425 degrees. line a small ovenproof tray with foil. lightly brush both sides of each piece of bread with a tiny amount oil, from the 2 tbs separated, and set aside. lay the bread on the foil-lined tray and toast for 5 minutes. meanwhile whisk the vinegar, shallot, 1/4 tsp of salt and the pepper into the 2 tbs of oil and set aside. whisk together 1 tbs of oil, the mustard, paprika and 1/8 tsp salt. set aside. after the bread has been in the oven for five minutes, remove tray and turn the slices over. lay a slice of cheese on the centre of each slice. sprinkle the hazelnuts on top of the cheese, and put the tray back into the oven for 3-5 minutes, until the cheese has softened and started to melt at the edges. meanwhile, toss the salad with the shallot and vinegar dressing. plate onto a serving platter or individual plates. 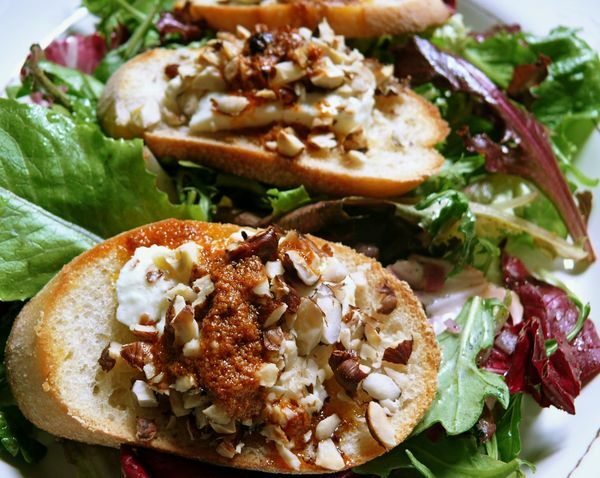 remove the toast from the oven and plate the toasts directly onto the salad. drizzle the paprika dressing over the cheese and nuts and serve immediately. hi shayma! i love paprika too. i grew up with only the hot variety, but two years ago i travelled to budapest, where they use the spice in everything, and brought back, hot and sweet varieties. i still gravitate toward the hot–which is what i used here. what do you use the sweet one in? This sounds absolutely delicious- thanks Yasmin! A new way to use Paprika- one of the most beloved spices in all of Spain- I will try it. um, that sounds DELICIOUS! thanks for this, mary luz! im going to have to insist you come back all the time if youre going to leave recipes in the comments! 🙂 i am looking forward to trying this!